Now, thanks to Falcon’s engineering team, the award-winning online rackmount SSG Industrial UPS models (1.5 to 6kVA) are now available with a hot-swap Lithium Iron Phosphate (LiFePO4) battery. Why is this significant? 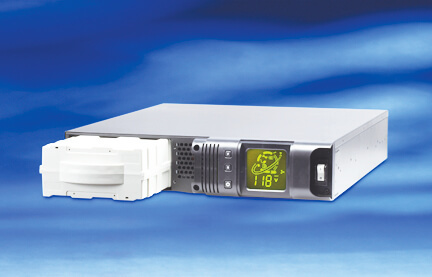 The Lithium Iron Phosphate (LiFePO4) battery dramatically increases the service life of a UPS. The LiFePO4 battery can last over 10 years depending upon the application and reduces costly battery replacement and downtime risk. Typically, a UPS using a valve regulated lead-acid (VRLA) battery has a life expectancy of 4 to 5 years. However, due to the susceptible nature of lead-acid chemistry to increased temperatures, the batteries typically yield only 1 to 2 years of service life in high temperature applications. The SSG UPS with a LiFePO4 battery provides triple the backup time, longer service life and 44% less weight than using a typical lead-acid battery. This, together with a significantly lower total cost of ownership (TCO), make the SSG with a LiFePO4 battery option a perfect choice for protecting critical equipment and processes against costly power problems.